Due to some odd scheduling with the holiday, the usual Monday edition of First Aid was moved to Tuesday. The Helpers discuss the Green Bay Packers and New England Patriots, why LeGarrette Blount is a good fantasy option for the playoffs and why those with Jimmy Graham should be excited rather than fearful after his zero target performance against Pittsburgh. Plus weekly awards and some talk about Johnny Manziel. Rodgers plays great against bad teams. But more importantly, he plays great against good teams too. Granted, he had the added bonus of a raucous crowd at Lambeau Field, but his talent was on full display here against one of the better secondaries in the league. Rodgers has been a monster these past five games, with fantasy point totals of 48, 34, 23, and 28. He's as matchup proof as it gets when it comes to fantasy quarterbacks, and will likely be a No. 1 guy heading into a matchup against a bad Atlanta team in Week 14. Brady continues to be one of the most reliable fantasy options. His last five fantasy point totals have been 44, 35, 18, 23, and 21. He's locked in as a QB1 but the San Diego Chargers have played well against quarterbacks this season. Blount looks like the guy in New England. His 10 carries led the Patriots and out carried Brandon Bolden, Shane Vereen, and Jonas Gray. The Patriots like him, and he's a steady flex option if you want to add him to your team. He'll likely have a touchdown or two now that he's getting the most carries. Lacy continues to be among the most reliable RBs and for those who traded for him or stuck with him during his dark weeks early in the season will be rewarded with a great playoff matchup against Atlanta in Week 14. Adams played well, but don't consider adding him or starting him. He benefited from Jordy Nelson and Randall Cobb drawing coverage from Brandon Browner and Darrelle Revis. Plus, he dropped a potential touchdown pass. Gronkowski remains the toughest matchup for any defense at the tight end position. His 12-yard run where he trucked three defenders on his way to a near touchdown is an example. George and Scott do their usual fantasy breakdown of two matchups this week, and assess the damage of the week that was in the NFL. Plus, they hand out weekly awards and discuss things to do in Wyoming. Two rookies came out of the woodwork in this one and are must owns in all leagues going forward. Andre Williams and Odell Beckham Jr. both shined in New York's victory over Atlanta. Filling in for an injured Rashad Jennings, Williams put his violent running style on full display, trucking defenders on his way to 65 yards and one touchdown on 20 carries. It was a solid day for Williams considering this was the first time he has been thrust into the starting role as a rookie. The offensive line of the Giants provided good blocking at times (especially the tight ends who helped seal the outside on a lot of off tackle plays) and Williams made the most out of it. Depending on Jennings' status going forward, we could see Williams take on a more substantial role within the offense. In the receiving game, rookie first-round pick Odell Beckham Jr. (owned in just 9% of Yahoo! Leagues) scored a touchdown on a crucial play in his first NFL start. He saw five targets, which was third behind Reuben Randle (10) and Victor Cruz (6) but he made the most out of them. He caught four passes for 44 yards, and already clued spectators in as to how efficient he could be. Factor in his return yards and this is a natural receiver you want to get your hands on if you're high on the waiver wire. The Giants play the Philadelphia Eagles this week, a team that's been susceptible to the pass (they allowed 3 touchdowns from Austin Davis this week and let Kirk Cousins throw for more than 400 yards on them.) Eagles linebacker DeMaco Ryans also left the game and if he's hurt, then Week 6 could be a big day for the Giants offense. This game was all about two things — Golden Tate and Calvin Johnson. Already not 100 percent coming in, Johnson aggravated the same ankle that was bothering him after he took a hit from Bills CB Leodis McKelvin. He left the game after recording just one catch for seven yards. His status for Week 6 will be monitored closely no doubt. Tate flourished in Johnson's absence, finishing with 7 catches for 134 yards and a touchdown on a team-high 9 targets. Tate now has put together back-to-back 100-yard performances and is on pace for 1,014 yards and 3 touchdowns. He's a WR2 with WR1 upside in a high-powered offense riddled with injuries to receivers and running backs. The rushing game was non-existent for both teams, with both teams combining for a little over 100 yards rushing. Fred Jackson was the top rusher for Buffalo, finishing with 10 carries for 49 yards while George Winn led Detroit with 11 carries for 48 yards. Expect starter Joique Bell to return as the Lions top rusher in Week 6 after being sidelined with a concussion for Week 5. Jackson remains a solid flex play due to his versatility (he caught 7 passes for 58 yards as well). Rookie Sammy Watkins continued to impress for Buffalo, catching 7 passes for 87 yards on a team-high 12 targets. He's a WR2/3 going forward but will likely be hampered by the Bills' situation at quarterback. Speaking of, Kyle Orton finished 30-of-43 for 308 yards, one touchdown and one interception. Episode 8: You Down With ADP? Goal of this podcast: To help you understand who the best backup running backs are on their respective rosters. With this knowledge, you can avoid taking a No. 1 feature that’s either injury prone, struggling due to old age, or is just not as talented as the team’s No. 2 guy for whatever reason. 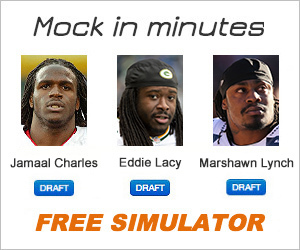 This should help fortify your roster with reliable running backs. Goal of this podcast: With Scott on vacation, I bring in a different guest to talk fantasy football. The problem though, is that he's not all that knowledgeable. Goal of this podcast: We have out of body experiences and take on the personality of players we think are going to be good quality in 2014. Then, we try and convince ourselves to draft one another. From Lamar Miller to Giovani Bernard, there are players with huge upside this season and we state our case as to why. Goal of this podcast: We go off the deep end a bit to provide you with some not-so-popular predictions for this year’s football season. Hopefully, you’ll come away with a few advantages for your draft to give you a slight edge on the competition. Remember, last year is in the past. It’s all about this season.